If you remember waaaay back to July, the most effective strategy in our battle with Blackstone/SESAC was calling on SESAC songwriters to apply both internal and public pressure on SESAC to back off of their efforts to amend, and ultimately kill, the MMA. We can use the same strategy here. SIRIUS engages many artists and songwriters as their public face. 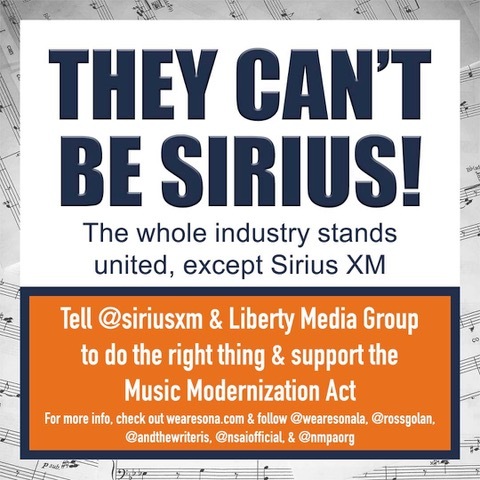 We are in the process of enlisting as many artists with SIRIUS channels as possible to both publicly and privately push back at SIRIUS’s current mission to tank the bill. "Hey ____! We need your help! The Music Modernization Act is a bill that songwriters and artists are fighting to get passed in the US Senate. The legislation creates a fair way for songwriters to get paid from digital streaming, which doesn’t exist right now. Sirius XM and its owner Liberty Media are showing up in DC this week to offer self-dealing amendments that will effectively kill the bill. Can you communicate something like this to @siriusxm? “Please back off trying to kill the Music Modernization Act. Sirius XM needs to help the music community pass this bill to keep working songwriters creating great music for you and your paying listeners.” Thank you!" I really do hate to use this phrase, because it’s SO on-the-nose… but this is serious. We need all hands on deck to fight off the threat SIRIUS and Liberty Media pose.